If you have been following me on my quest for a healthier lifestyle then you know I’ve been giving myself plenty of time to make meaningful changes to better my health. If you have not been following, I will link my 3 previous blog posts at the bottom. To start with great news, I’m down another 2.5 pounds! It’s coming off slowly but it’s coming off and staying off for good. If you step back and think, 7 ½ pounds in 4 months is hardly anything. However, I’m remaining positive because my goal is for the weight to stay off, so if it takes me longer so be it. I’m staying focused on my action statement and the positive changes I have noticed. Finding healthy snacks hasn’t been difficult for me. Coming up with healthy combinations to keep me full hasn’t been difficult. What has been difficult is snacking while traveling and learning to control my sweet tooth. When I’m traveling, I worry about food safety and keeping my snacks cold for long periods of time. I need things that I can quickly grab and toss in my bag. If I don’t have those things on hand then I’m left to stop at a gas station for items and take the risk of being sucked into the candy bar aisle. I’ve put together a list of healthy carbohydrate and protein snacks that don’t need temperature control. You can find that post over on Live Smart Ohio. One of my biggest problems I’m facing on my journey is controlling my sweet tooth. I needed a “WHY”. Why is it I always leave the healthy snack I packed in the refrigerator and go for the chocolate treats in the workroom? I wanted a way to stop those cravings! I found this amazing handout on 13 Ways to Fight Sugar Cravings. There are tips to try right now and then there are other ideas on how to discover the real root of the problem. After reading the article I took time to stop and think about what I was doing and why was I doing it. I’ve noticed that I give in more to my sweet tooth if I’m not eating regularly. I also know that I can’t give in a little. If I give in a little then I want to eat it all!! I do better with combining foods. Adding a little dark chocolate with my almonds or having some dark chocolate covered strawberries. I’m also working on removing the temptation. Out of sight, out of mind. Making sweets harder to get to has helped too. I’d love to hear some ideas on how you curb your sweet tooth? The new year is upon us which means everyone has made their New Year’s Resolution. Did you make yours about weight loss? Every year mine revolves around weight loss. Weight loss and I have a love-hate relationship. Some years are good and other years not so much. I would like to share with you my personal struggles and how we can work together to lead healthier lives. A few years ago I worked really hard at following a weight loss program and lost 40 pounds. I felt amazing! I had more energy and my self-confidence really improved. However, the next year, work became very stressful. Over the following years, I’ve gained all of it back, plus a little more, through emotional eating and other life changes. I self-sabotage my efforts. I don’t just fall off the “diet” band wagon; I fall off and set it on FIRE! It’s a vicious cycle that I’m putting an end to now. Maybe you’re like me and have made decisions in the past to crash diet, and you’ve messed up your metabolism. You weigh yourself every week and when the weight isn’t coming off fast enough you feel a sense of failure and give up. As a professional, I know and have read all the right things to do. There are blog posts on Healthy Habits and articles on how to Start Losing Weight. But, old habits are hard to break. Personally, I have a major sweet tooth and sugar is very addicting. Today, I’m asking you to join me in taking baby-steps to a healthier you. It may take longer, but the tortoise beat the hare, remember? My plan of action is to make small changes over a certain period of time. I want to give myself time to take action and evaluate my success. I also want to identify my unhealthy eating triggers. Therefore, I’m allowing myself two weeks to make each change. This way I can make a small change the first week and then brainstorm ways to avoid unhealthy triggers the second week. I will start by changing my breakfast foods, then I will move onto snacks, dinner, lunch, and finally, beverages. 1. For mornings on the run, I’ll grab a low-fat Greek Yogurt, a small piece of fruit, and a piece of Sprouted toast with a small smear of all-fruit jam. Personally, I have found that sprouted bread is more gentle on my blood sugar. However, you could substitute your favorite whole grain bread. 2. For Saturday morning breakfast with my family, I love to make Cinnamon-French Toast. I’ll again use sprouted bread, and I’ll replace the whole eggs with egg whites. A little light syrup and some fresh berries will make this feel like such a treat! 3. Some days I’m way ahead of the game and have Overnight Oatmeal in the refrigerator ready to go. Will Walking Faster Help Me Lose More Weight? Should I walk faster or does it count when I walk slow? That depends on what benefits you are seeking to achieve. Losing Weight – The waist circumference of each group was reduced the same amount when they walked moderately and briskly in a recent study sponsored by the Canadian Institutes of Health Research. Thus, it did not seem to matter if you walked fast or moderately, just getting out and walking helped. This can help reduce your risk of obesity. 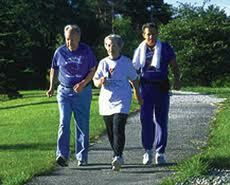 Walking for Cardio-Health – Walking faster does improve your cardiorespiratory fitness. If you choose to walk at a moderate intensity pace you need to walk longer to achieve the same effects. You can also increase the intensity by walking uphill or increasing the incline on your treadmill. Glucose Tolerance – This study used the glucose tolerance test to see if calories from sugar were efficiently processed by the body within two hours. This test can predict a person’s risk of developing diabetes. Only those walking briskly saw an improvement in the test. Walking moderately for a long period or shorter period of time did not have an effect. • Improve your blood pressure, cholesterol levels, and blood sugar levels. Do you have a walking routine that needs a change? Try walking alternately fast for a few minutes and then slower, or walk fast for a quarter of a mile and then slower and then fast again. Find a park to walk at and enjoy the beauty of the scenery around you as you walk. Walk with a friend and/or a dog. I walk with a friend and my dog. My dog gets so excited to take a walk; she starts barking when I get the lease out. Why not try walking with a friend? Ross, R., Hudson, R., Stotz, P., and Lam, M. (2015). Effects of Exercise Amount and Intensity on Abdominal Obesity and Glucose Tolerance in Obese Adults. Annals of Internal Medicine 162(5), 325-334.